The Season of the Witch Hunt? Way back yonder in my school days, kids would get together based on hate. They didn't really understand hate, but they were upset with someone and disliked him or her. Then they'd recruit others to join them in their persecution efforts. You see that kind of thing today with the advent of the Internet, which became a useful tool for cyberstalking. Cyberstalking is a crime (not that people care about the law until they're actually captured). In some cases, cyberstalking and vicious bullying have driven people to suicide — and worse, such as in the case where it led to the deaths of three people. While it's fine to fellowship with people who agree with you on things (Christians are exhorted to do so throughout the New Testament, for example), recruiting people to join in a witch hunt is petty, childish, and harmful. Part of that is based on an inner need for acceptance and to feel important (some people want to save the world from the "evils" of biblical creation but do not have a consistent moral foundation for good and evil, for example). I reckon some people never grow up, and go on a kind of witch hunt against "the enemy". Unfortunately, Christians do the same nonsense. On a side note, the witch hunts of history were done by people who had little or no knowledge of what the Bible teaches, especially the New Testament. 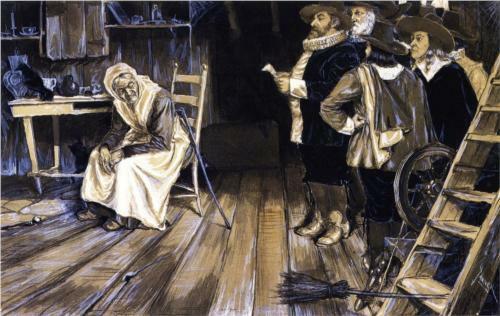 Here in the U.S. of A., I consider the Salem Witch Trials a travesty and a black mark on the histories of the country and those who pretended to represent God. And I don't have good things to say about the witch hunts in other parts of the world, either. Used under "Fair Use" for educational purposes. Besides, it's in my e-mail. For a professing Christian, he is acting in a very unchristian manner. 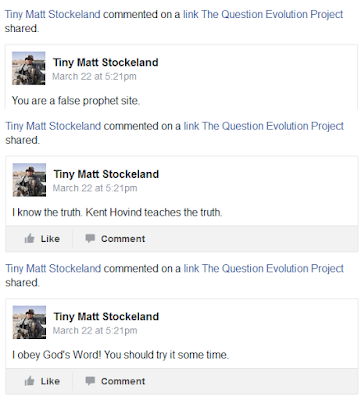 He disliked the Easter post (which he refused to read, preferring Kent Hovind's material). The entire Page is a "false prophet site" because of one item with which he disagrees? He used to like the posts. (Good thing he didn't find out I'm not a member of the King James Onlyism cult!) I challenged him to find something that was false in the Statement of Faith, but that received no response. Hero worship is a bad thing, as is poor knowledge of biblical teachings about our liberty in Christ. Used under "Fair Use" for educational purposes. Chris Rosebrough endured his own witch hunt. Tullian Tchividjian is a disgraced preacher, and Chris wanted to get more information and urged people to slow down on the matter. Because Chris Rosebrough refused to join in the persecution of Tchividjian, he received his own harassment from people who could not be bothered to actually learn the facts, or even give a Christian a fair hearing. You can learn more at "A Statement RE: Tullian & the New Allegations" as well as audio at "What Constitutes a Witch Hunt?" EDIT 7-02-2017: Rosebrough gave him a chance, but Tchividjian turned out to be dishonest, and no longer can associate with him until Tullian repents. Dr. James White had his own harassment. He wrote a post about a black kid flipping off a police officer, speculated about the times in which we live, and the kid's upbringing. The resulting firestorm said that that Dr. White is a racist, and people were repeating the allegations without checking the facts and White's public history. He later wrote a detailed article on this, and dealt with a libeler. What was interesting to me was that he echoed some of what I have been saying about anti-creationists who view things through their Darwin spectacles (presuppositions). Dr. White talked about how people use their "lenses" to view the world, and often have to interpret events based on ethnicity and culture. See the long but important article, "Gospel Lenses and the Search for Allies (Updated with Full Response)". Also, he responded in an earlier "Dividing Line" episode (free to watch or download the audio") at "Ethnic Gnosticism and the Gospel". My experiences being the hunt-ee are insignificant in comparison to those of Chris Rosebrough and Dr. White, as I have not been attacked by anyone of consequence or had large-scale harassment that needed much of my attention. But those two had to take significant amounts of time in the instances above, and at other times, to spend time making clarifications. (And no, although my remarks about cyberstalking being a crime and having caused the deaths of people, White and Rosebrough are not going to be driven to suicide. But some people are setting themselves up for criminal prosecution and also litigation.) Brethren, these things should not be! This witch hunt mentality is one reason I sometimes despair of calling myself a Christian, since too many Christians are seeking self-importance instead of the truth. Some of us emphasize critical thinking and checking facts instead of spreading sensationalistic material and libeling others. Ministers end up having to waste precious time defending themselves over false allegations when they want to be about the business of proclaiming the truth. Come on, Christians! To be blunt, this kind of behavior is expected from children, atheists, and cultists. You're being fools. Although we all sin, some need to do some serious thinking, repenting — and growing up.